1. He was born in Poland near Lodz in 1859 and at an early age showed literary talent. At fifteen, he published both a sonnet translated into Hebrew from Heine’s German and an original short story in Hebrew. 2. He studied philology, philosophy and history of art at the University of Breslau. 3. His first volume of short stories highlighted Jewish characters in conflict with the attitudes and traditions of their society – a rabbi who smokes on Shabbat; an accomplished singer who abandons her people for a career. 4. 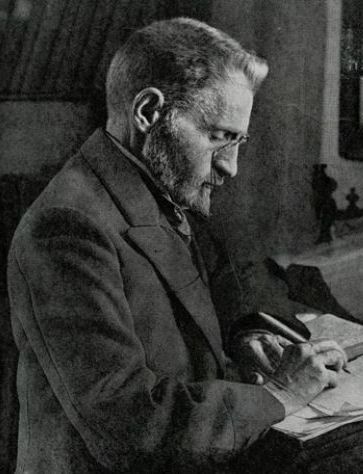 Though he never made aliyah, he visited Palestine twice, once in 1911 and again in 1912, and published The Land of Israel in 1913 – writing with enormous feeling about the land, its holy places, the pioneers and the beginnings of the revival of spoken Hebrew, about which he’d been tepid before his trips. 5. He was not an observant Jew. He thought one should act according to his own conscience, rather than religious law or tradition. He did not believe that Judaism could be adapted to the spirit of his time. 6. Nonetheless, he identified with Abraham as an iconoclast, one who strikes out on his own rather than following the old ways. 7. Frischmann was an innovator in style, structure and content who achieve literary fame. Devoted to literature, he refused to employ his pen for political purposes, which he considered petty. His “Letters Concerning Literature” is one of the foundations texts of modern Hebrew literary criticism. 8. Throughout his literary career, he produced superb translations into Hebrew: of George Eliot, Pushkin, Byron, Neitsche and Hans Christian Andersen; of Goethe, Oscar Wilde, Anatole France and Shakespeare, and even a magnificent rendering of the poetry of Indian writer Rabindranath Tagore. 9. Bar Midbar, published in 1923, was a collection of stories written in biblical style and language, set in the desert following the Exodus from Egypt. The tales highlight the quandary of the Israelites, torn between their familiar habits and lusts on the one hand, and the new moral law that has been given to them on the other. I have not been able to find evidence that these stories were ever translated into English. If somebody out there knows differently, please leave a comment. 10. He died and was buried in Berlin, August 1922 . I cannot bear their prattle, their expressions, their talk or their conversation. Their prophets are not my prophets, their angels are not my angels. I detest feelings, feelings without hearts. 1. 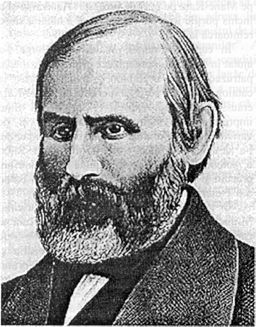 Abraham Mapu was born in 1808 near Kovno (now Kaunas), Lithuania. 2. An autodidact, he taught himself German, French, Russian and Latin. 3. He earned his living as an itinerant teacher of Jewish children. 4. He was a member of Haskalah, a movement that favored adoption of enlightenment ideas and values and pressed for more engagement of Jews in the secular European world. 5. He wrote novels in Hebrew. The first of these, Ahavat Zion (Love of Zion), was published in 1853. Ahavat Zion is considered the first modern novel in Hebrew. It had an important influence on later fiction, as well as on the adaptation of Hebrew to modern life. It was translated into English as Amnon, Prince and Peasant. 6. His novels, set in ancient Israel, had intricate plots detailed in poetic language. Their utopian vision of ancient Jewish life contrasted sharply with the reality of 19th-century life in Eastern Europe. His characters were larger-than-life depictions of the enlightenment ideal. 7. These works became catalysts for the Zionist movement: David Ben-Gurion, in particular, was inspired by them. 8. 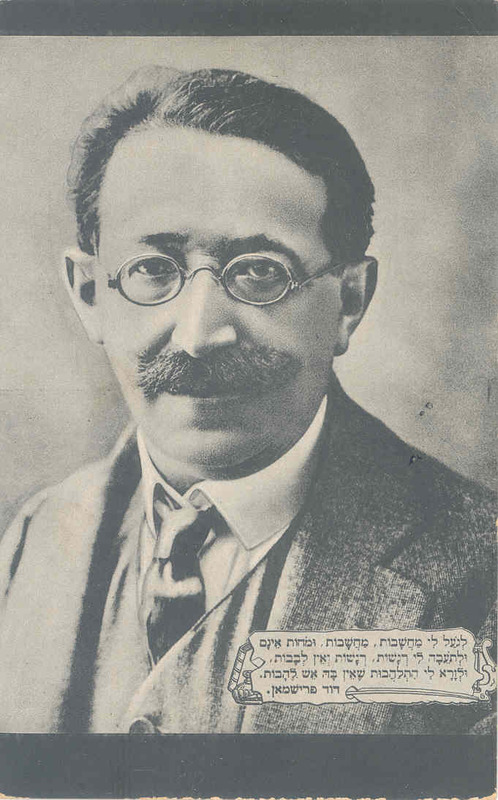 Mapu also published several textbooks in Hebrew. 9. Perhaps the first modern Jewish historical novelist, he was unable to support himself by his writing (so what else is new?). 10. He died in Konigsberg, Prussia, in 1867. 1. No, he wasn’t a Jew (how many Jews in those days could afford so many names? ), but he was important to the history of Jews in Palestine. The boy who would become the first Viscount Allenby was born in Nottinghamshire in April 1861. Early on, he developed a passion for poetry, ornithology and botany. 2. He was educated at the Royal Military College at Sandhurst and at the Military Staff College in Camberley, England. He distinguished himself in the Second Boer War (1899-1902), ending as a Colonel. 3. During World War I, he served initially on the western front. As Commander of the Third Army, he came under criticism for the failure of the assaults at the Battle of the Somme in 1916 and the Battle of Arras in 1917. 4. He was sent to command the British Expeditionary Force in Egypt in June 1917. He reorganized the force, enlisting the aid of T.E. 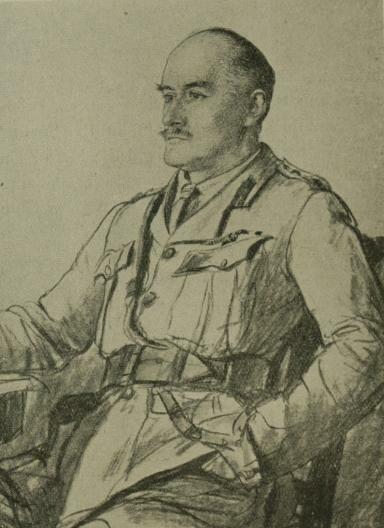 Lawrence in winning the support of Arab irregulars; by the fall of 1917, he had taken Gaza with a surprise attack on Beersheva. 5. 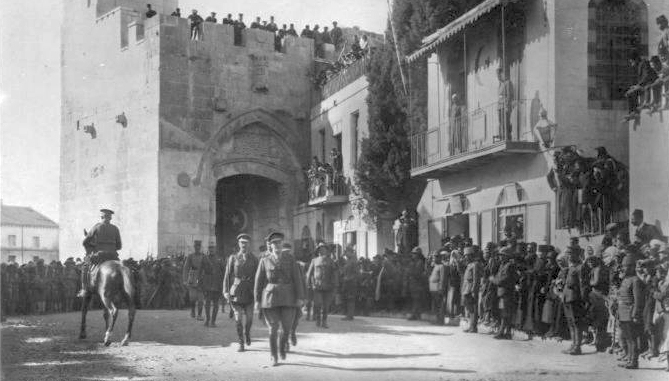 When he captured Jerusalem in December 1917, he officially entered the city on foot through the Jaffa Gate – rather than on horseback – as a sign of respect for the city’s holiness. It was an important victory for the Allies. This photo appeared in newspapers around the world. 7. In a war in which commanders typically stayed far in the rear, Allenby was known and admired by his soldiers for having his headquarters close to the front lines. 8. With a brilliant scheme of deception and diversion, in September 1918 Allenby’s troops broke through Turkish lines at the Battle of Megiddo – in which two battalions of Jewish volunteers served bravely. Using cavalry and airplanes, Allenby achieved lightning success. 9. Turkey surrendered by the end of October 1918. Allenby’s success virtually guaranteed the British mandate in Palestine. 10. He was made a field marshall in 1919 and ennobled as Viscount. He served as High Commissioner for Egypt and the Sudan until 1925. In May 1936 he died of a ruptured aneurysm; his ashes are buried in Westminster Abbey. You’ll find Edmund Allenby in my novel Rivka’s War, coming out this spring. 1. He was born Eliezer Yitzhak Perelman in Lithuania on January 7, 1858. He studied in a yeshiva and then a Russian gymnasium, completing his studies in 1877. That same year, he was stirred by the Bulgarian struggle for independence from the Ottoman Empire, and he began to contemplate the idea that Jews might claim their own land and language. 2. He left Russia in 1878 to study medicine in Paris, with the idea of practicing this profession in Palestine. However, he soon had to abandon this plan, when he contracted tuberculosis. 3. He arrived in Palestine in 1881 at the beginning of the waves of Jewish immigration to come, having already published a number of articles on renewing the Jewish people, their land and language. 4. Though he knew French, German and Russian, he spoke only Hebrew to every Jew. His household was the first Hebrew-speaking home in Palestine, and his son, born in 1882, was to be the first child in modern history to hear and speak only Hebrew. 5. He coined new Hebrew words for everyday objects: doll, jelly, towel, bicycle. 6. He became involved in the first efforts in Palestine to use Hebrew as the standard language in school – despite the dearth of textbooks, materials, games, songs, vocabulary, and teachers who could follow his example. 7. In 1884, he began his own weekly newspaper, Hatzvi (The Deer); it was not the first or only Hebrew newspaper, but certainly the most far-reaching, introducing new words into parlance and discussing not only Jewish topics, but (to the extent the Ottoman authority would allow) general political, social and cultural topics. He advocated for a plain, unadorned prose style without the inflated rhetoric that had been popular. 8. To further the adoption of Hebrew, he became a lexicographer, defining the language along strict philological lines, eliminating Aramaic and other foreign words from ancient texts – though he did introduce transliterations from modern tongues. This resulted in his Complete Dictionary of Ancient and Modern Hebrew. He worked on it day and night, publishing six volumes in his lifetime. After his death, his wife and son continued to publish his manuscript, completing the seventeenth, and last, volume in 1959. 9. In 1890, he founded the Hebrew Language Council to arbitrate matters of terminology, pronunciation, spelling and punctuation pertaining to the use of Hebrew. 10. In November 1922, the British mandate authorities recognized Hebrew as the official language of the Jews of Palestine. A month later, Eliezer Ben-Yehuda died. His is buried on the Mount of Olives in Jerusalem. 11. His work did not go unopposed. The orthodox community bitterly resented his attempts to revitalize the holy tongue; they even managed to get him thrown in prison for a time. 12. He is my hero.